This new 5,000 s.f. 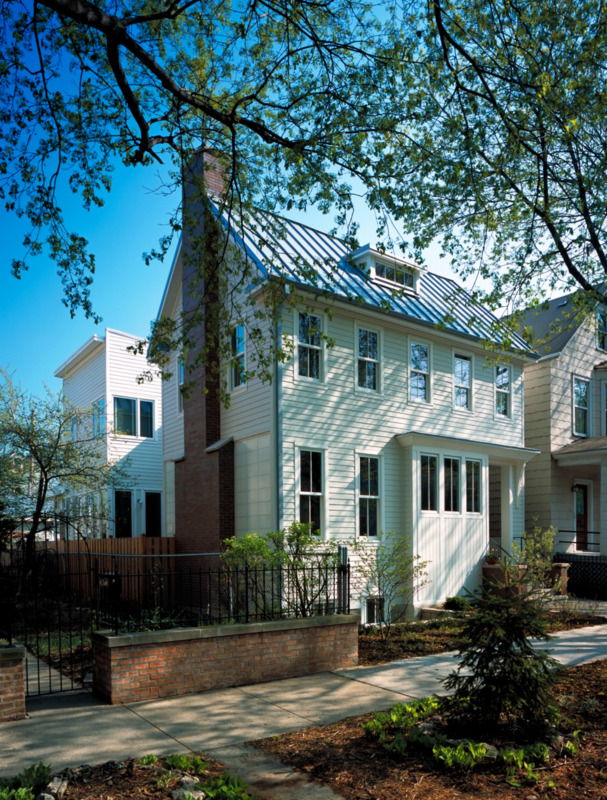 home takes advantage of one and a half standard city lots by avoiding the typical full lot width box typically found in Chicago and instead breaking the form to reduce the scale, and to introduce ample natural light. The clients preferred a more “polite” face to the street, however were open to a more modern interpretation on the rear portion of the home. The solution incorporates a clean “farmhouse” façade with an assemblage of volumes to accommodate the remainder of the program requirements. Upon entry, the foyer provides large south facing windows high enough to allow generous natural lighting, without sacrificing privacy. 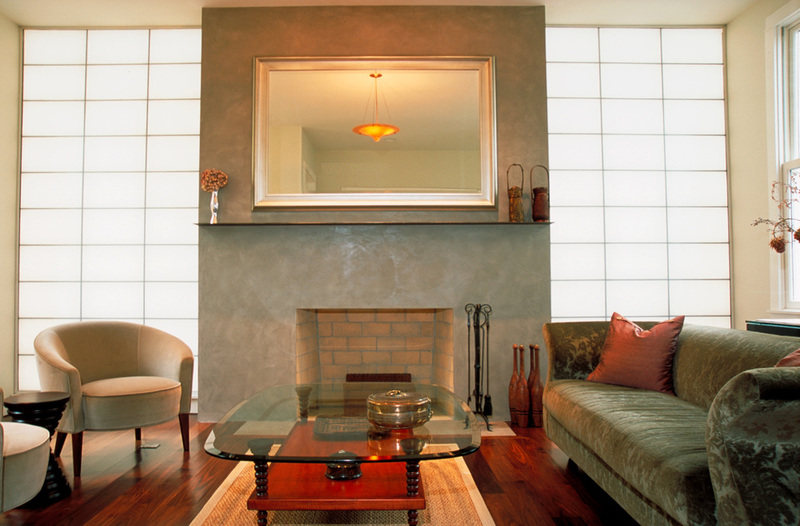 The living room features a large colored plaster fireplace wall flanked by translucent insulated wall panels evoking a shoji screen look. The north windows of the living space open onto the exterior courtyard that is accessed from the connector hallway off of the stair hall. Progressing toward the rear of the house one then encounters a volume containing both dining room and kitchen spaces which are separated by sliding glass and wood partitions. Beyond the kitchen/dining room and facing the rear yard is another separate volume housing the family room with a tall ceiling, fireplace and floor to ceiling glass. 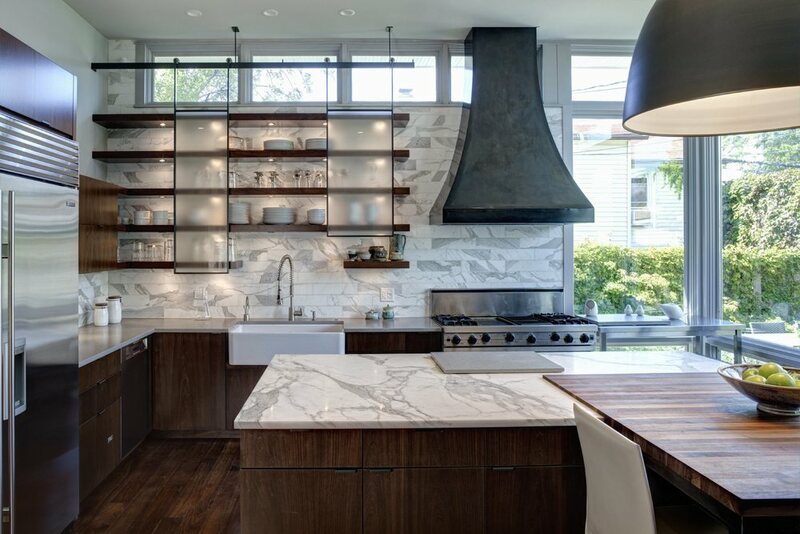 After living in the house for 10 years the owners decided to re-arrange spaces and embarked on switching the location of the kitchen and the family room, giving the kitchen a larger, taller more light filled space with direct contact to the rear yard. 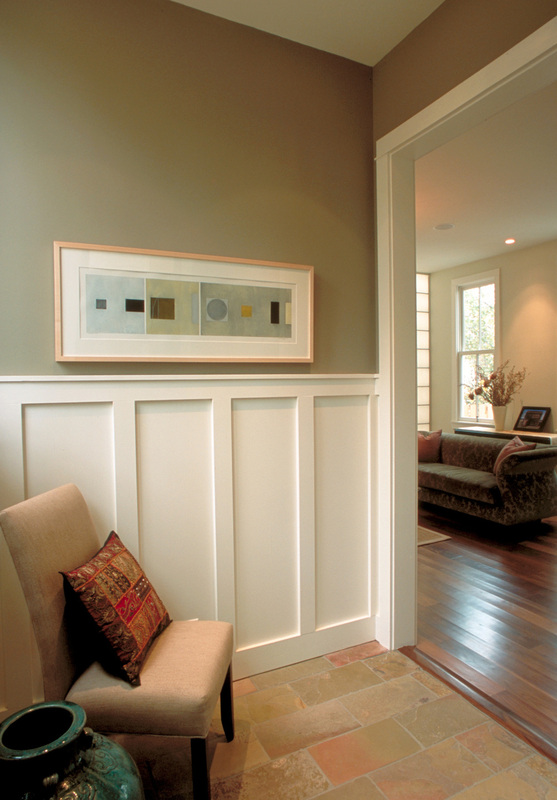 As part of this second project, the mudroom was re-designed, a patio space was added in the rear yard, and the dining room and family room (which was formerly the kitchen) had built in cabinetry pieces and new light added. 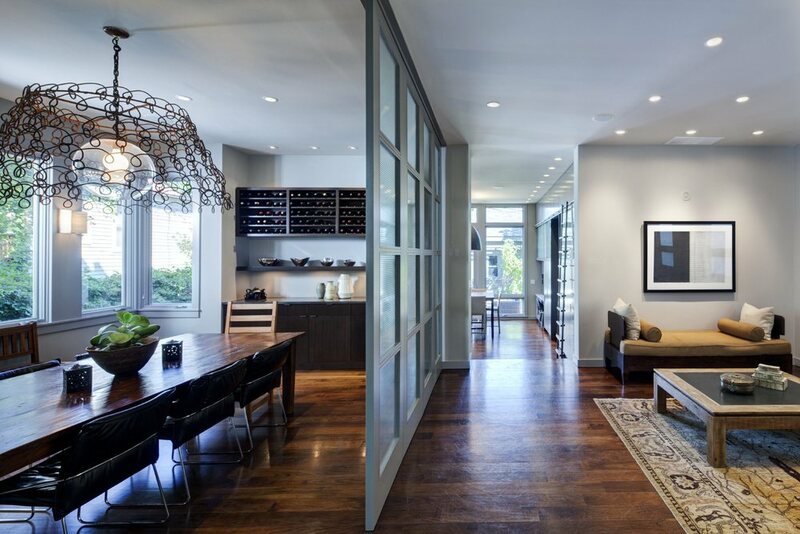 The lower level of the home provides a guest suite including bedroom, bathroom, and galley kitchen, along with a wine cellar, large playroom and storage room. Kitchen Trends Magazine, Volume 29, No. 3, 2013, "Night and Day"
Chicago Tribune, January 23, 2011, Money and Real Estate Section, "A Good Fit"